"You can live free from stress and confusion." Padma, also known as Padma Shyam, is an enlightened educator and one of Canada’s most respected and popular teachers of meditation, yoga and self-realization. Padma is also the television producer and host of 143 episodes of the Padma Yoga television series aired across Canada since 2003, and has produced 12 DVDs of her work. She has taught meditation and yoga to A-list Hollywood stars since 2000, and has developed original Online Meditation Courses and a Meditation Certification Program. "My class with Padma was a great wake-up call for my yoga and meditation." Padma has over 30 years of experience in yoga and meditation, including a 30 years of advanced meditation teachings in the Himalayas of India, where she currently continues to spend much of her time every year in continuing study. She is certified to teach Advanced Meditation, Advanced Yogic Studies and Hatha Yoga by the International Meditation Institute of India. Padma masterfully translates timeless wisdom into modern language, making complex eastern knowledge available and relevant to western culture, helping us build health and calm strength in a modern and dynamic world. She is highly regarded for her extensive studies and vast knowledge of classical yoga, re-knowned as Canada’s own Meditation Master. Padma’ is the name offered to her by her teacher in the Himalayas. The name ‘Padma’ means ‘The Lotus Flower’ and is a very important symbol in India and in Asian cultures. The Lotus represents spiritual purity and intellectual awakening. The thousand-petalled lotus is the sign of complete spiritual enlightenment. Padma is also another name for the goddess, Laxmi, the symbol of wealth, prosperity, abundance and beauty. "I love my meditations with Padma. In interviews after these classes, I speak with more clarity, surety and self-awareness." "Sit quietly and in stillness with your eyes closed. Don't attempt to control or suppress the waves of your mind. Instead, remember that you are pure and free." Padma lived in a remote valley of the western Himalayas of India, with a Himalayan meditation master, for a decade. Padma researched and contemplated advanced meditation, having daily discussions and meditation with her guru, and receiving direct transmission of the lineage teachings. She mastered original Sanskrit texts of classical yogic philosophy, specializing in the Patanjali Yoga Sutras and the Bhagavad Gita. For years, Padma meditated up to six hours a day. Lifestyle in the Himalayas was rustic and minimal, including basic tasks such as boiling drinking water and keeping the wood stove burning. She cooked and lived with no electric appliances, modern conveniences, or hot running water, spending the years in meditation and study. 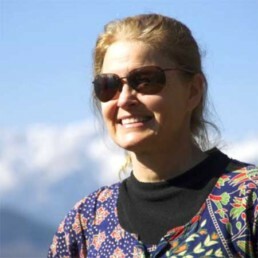 Padma, Marla Stewart, B.Sc., worked as an environmental researcher for the Canadian Federal Government, but seeking deeper personal happiness and looking for the root causes of destructive human behaviours, she traveled to the Himalayas to learn. Certified to teach ‘Advanced Yogic Sciences and Meditation’ (M.M., Senior Level) and ‘Hatha Yoga’ (1000-hour Senior Level) by the International Meditation Institute of India, she is a unique educator specializing in a holistic approach to mental, physical, and spiritual wellness. Her western science and philosophical studies inform and expand her exceptional education in eastern practices. She is a unique bridge between the two worlds of wisdom and speaks with eloquence of their oneness. Padma owned the Padma Yoga and Meditation Center in Vancouver, B.C., in 2002, and since 2000 has taught yoga and meditation to professionals, government agencies, and Hollywood celebrities. Hosted and produced the 26-episode nationally-aired TV series ‘Padma Yoga: Blissful Living’, 2010. Hosted and produced the 26-episode nationally-aired TV series ‘Padma Yoga: Modern Meditation’, 2010. Hosted and produced the 26-episode nationally-aired TV series ‘Padma Yoga: The Elemental Series’, 2009. Hosted and wrote a 65-episode nationally-syndicated television series, ‘Living Yoga with Padma’, 2003. Hosted a 12-part radio show on CBC radio, North By North-West, 2007. Featured as a Lululemon Ambassador at their main store on West 4th Ave, Vancouver, 2007. Presented at the 2007 Toronto Yoga Conference; billed as a ‘Canada’s Meditation Teacher.’ Sponsored by Channel ONE in Toronto. Featured in a meditation article in Reader’s Digest, 2008. Founded and developed the departments of Meditation Studies, Learning and Development, and Continuing Education programs at YYOGA, Vancouver, 2008 and 2009. Owned and directed the “Padma Yoga Center” in Vancouver, 2002. Produced two best-selling educational DVDs, 2006, “Mountain” and “Ocean”. Initiated the founding boards of the Yoga Association of BC (currently a Senior YABC Instructor), and the Yoga Outreach of BC. Taught meditation and hatha yoga and all yogic arts such as Sanskrit, chanting, breath, and philosophy, to top yoga teachers across Canada and the US since 2000. Since 2000 has been invited to host workshops across Canada, the USA, Mexico, Bali, France, the UK and central America. B.Sc. in Biology from McGill University; Worked for the Federal Department of Fisheries & Oceans. Since 1989 immersed in an advanced meditation retreat in the western Himalayas with the meditation master, Swami Shyam, and now again lives there part-time. Since 1982 has practiced hatha yoga. Spent two years in Tokyo learning Zazen meditation; Has attended Soto Zen retreats with Norman Fisher. "Padma radiates a sweetness and bliss. I have all of her discs and watch her show as often as possible." "You are a Lotus flower – completely one with all the wonderful and changing happenings in the world, and yet forever remaining pure and free, clear in your knowledge of who you really are."